Sage Construction and Real Estate goes far beyond its specific software/technology focus in its Plumb Bob Square Rants blog, with a diversity of posts in a consistent, highly readable format. 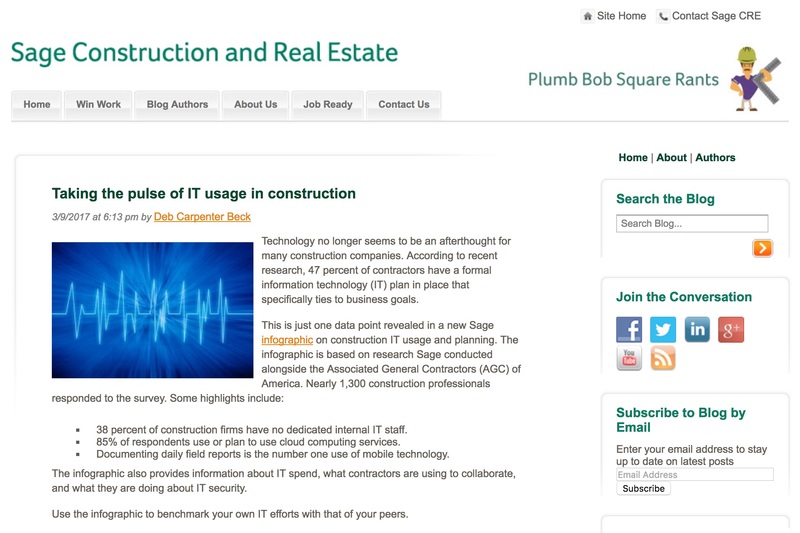 Technology no longer seems to be an afterthought for many construction companies. According to recent research, 47 percent of contractors have a formal information technology (IT) plan in place that specifically ties to business goals. 38 percent of construction firms have no dedicated internal IT staff. 85% of respondents use or plan to use cloud computing services. Documenting daily field reports is the number one use of mobile technology. The infographic also provides information about IT spend, what contractors are using to collaborate, and what they are doing about IT security. Yet technology isn’t the only topic. Another post takes on the topic of women in construction, reporting that progress has stalled. Today, while the industry has rebounded, it’s basically back to square one when it comes to women workers. As of January 2017, about 857,000 women were employed in construction, still less than pre-recession levels. Only 12.6 percent of all construction industry workers are women. That’s an awfully small percentage, especially compared to other major industries. The number of women currently in apprenticeship and college-level construction management programs is also low. Many of the percentages I’ve seen are in the single digits. Construction educators are hoping to change that and are actively recruiting more women. It’s easy to understand how it can be difficult for girls and women to picture themselves in construction when the majority of workers they see are men. Many women in construction are taking matters into their own hands, making themselves visible by reaching out to local schools, career programs, and other women to share their experiences. Women helping women, in my opinion, will be a major catalyst to increase the percentage of women in construction. Overall, this is a truly effective and worthy blog, and in previous years, has scored well in the final competition for Best Construction Blog. You can cast your ballot until March 31. You can vote once, but can select as many blogs as you wish in your ballot.